What Does a Copperhead Snake Look Like? Copperhead snake facts, and what a copperhead snake looks like - The copperhead snake gets its name from the pronounced reddish coloration on the top of its head. Unlike other vipers, this animal has a distinctive neck. It is usually has a light brown base color and darker, irregular bands around the body. The copperhead lives mostly in forested regions, using the cover of leaves on the forest floor for camouflage. This snake had branched out to other regions, and can be found along waterways and in rocky territory. For years, people were under the impression that the bite from a copperhead snake was fatal. It is possible for the snake to inject enough venom to kill a human; however, this scenario almost never happens. When a copperhead snakes bites, it is because the animal is fearful. It will produce enough venom in the bite to injure it’s attacker and buy the snake time to escape. Copperhead venom will go to work on the living tissue surrounding the wound, and the bites can be subject to nasty secondary infection. Copperhead venom is considered to be the least potent of all the pit viper venoms. It is being used in research and development as a possible inhibitor for cancer cell growth. What region are copperheads most found in - Copperhead snakes are one of the venomous snakes in North America, though they are considered to be the least dangerous of all the vipers. They are excellent swimmers but spend most of their time on dry land. Copperheads can be found in most of the Southeast and Midwest. They are heavily populated through the Carolinas and Georgia. The snake lives in varying habitats dependent on its location in the country. Where do Copperhead snakes live? Copperheads are often found in thick forests, but in areas where soil and rocks are prevalent, the snake is just as much at home. Its brown coloration and misshapen markings makes it an ideal predator to hide beneath leaves and bracken. Most copperhead bites occur through accident when a camper or hiker steps over a log and onto a snake or reaches around the forest floor without looking. Unlike many other snakes, the copperhead is not overly concerned about changing habitat. 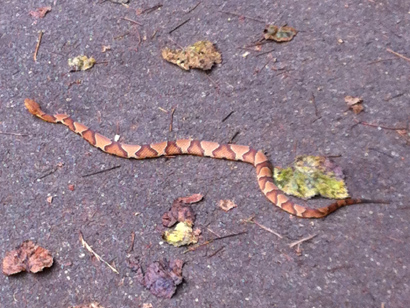 Copperheads are known to remain in areas near suburbs and cities as long as food remains plentiful. The snake is not picky, feeding on insects, reptiles, amphibians, mammals, and birds. It will usually wait under cover for a prey animal to come into range. The copper head snake is one of the acknowledged pit vipers in North America. This snake is of moderate size, with a thick body and a triangular head. Unlike other pit vipers, the copper head has a very distinctive neck. This animal lives in forested regions but will also branch out into rocky terrain. The copper head is most at home when camouflaged beneath leaves on the forest floor. When hibernation time comes around, the copper head will share a den with rattlesnakes and black snakes. There is no interbreeding between the species. Most people don’t realize it, but copper head bites rarely result in death—at least with people. The venom does have the potential to kill a human; however, the snake rarely injects enough to kill. When a copper head bits a person it is out of fear not predation. The most the snake is looking to do is escape. Wasting venom on a non-prey animal would be foolish in the scheme of survival. The snake will need that venom to eat later on. It is the red coloration on the top of this viper’s head that has bestowed the trademark name. Go back to the main Snake Removal page for more information about what does a copperhead snake look like. The copperheads are very common in North America and they are also very likely to bite even though their venom is quite mild. Their bites are also rarely fatal when inflicted on humans. Their name is befitting since they have copper red heads. There are some other snakes that are also referred to as copperheads and this is a very common name even though it is nonscientific. The water moccasins, the radiated rat snakes, the sharp nosed pit vipers and the Australian copperheads are also called copperheads most of the time. It is important to note that all these are all different from the North American copperhead. They are pit vipers just like the water moccasins and rattlesnakes. This means that they have heat sensory pits in between the nostril and the eye on either sides of the head and therefore can be able to detect any temperature changes so as to be able to strike the source of heat where prey is concerned. They are of a medium size and they average around 20-3 fear. The females are longer than the male counterparts but the males have longer tails in comparison. The snakes are very distinctly patterned. The dorsal pattern is actually a series of some dark, chestnut or even reddish brown cross bands and each has the shape of an hour glass, a saddlebag or dumbbell. The background has a lighter tan or it can be pinkish, salmon or brown. There are other non-venomous species that can have the same coloring and so can be confused with the copper heads. The distinctive feature is the hourglass kinds of markings. The copperheads rely mainly on camouflage so as to protect itself. The temperament an vary from one individual to the next. Some can be very reluctant when it comes to inflicting bites while others will bite defensively. They get defensive when they are encountered in the night or if they are disturbed during rest time. The copperhead can vibrate the tail in a rapid manner and emit a strong musk. They are semi social but hunt alone. They can hibernate communally and can go back to the same den each year.